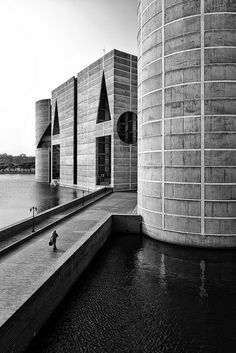 A key representative of a new form of architecture that combines natural elements with cement, Rafiq Azam completed his most recent home in the centre of Dhaka, Bangladesh in 2010. The strong contrast between the artificial and the natural represents an attempt to create something unique despite the degradation of the city around it. Water is an essential element of life in Bangladesh and a key to the people’s collective imagination. The whole country is a big delta for 52 rivers which are born in the Himalayas and cross Bangladesh to the Bay of Bengal. Unfortunately the capital city, Dhaka, has been developed with little regard for the original geography of the area, and lack of planning has resulted in chaotic urban sprawl generated by population growth aggravated by poverty and class differences. Dhaka is now a vast metropolis sprawling over more than 300 square kilometres, in which less than 5% of the land is covered with greenery. In recent years a new current of thought has guided a number of Bengali architects’ experiments in the direction of greater awareness of the value of their land as a unique resource and a heritage worth preserving. Shatotto is an architectural studio led by Rafiq Azam which is particularly committed to this line of thought. The studio works primarily on housing projects, with a strong accent on reconstruction of natural elements in the urban context, consciously taking advantage of the character of the local climate. The studio’s most recent project, the S.A. residence, completed in 2010 in the Gulshan district in Dhaka, fits into a setting characterised by multi-storey buildings made primarily out of cement, and the building reflects their hermetic outer appearance. 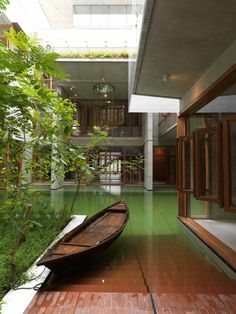 But the tradition of the single-family home on a single level with a garden is reflected in the design of the home’s interior, arranged around a courtyard with a ghat, a big swimming pool filling the whole courtyard right up to the rooms around it, which have views of the water and enjoy its beneficial effects. 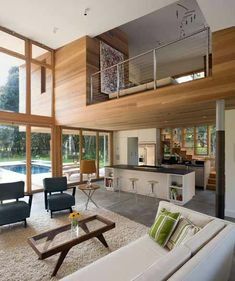 Oriented toward the south, where the home is most open to its surroundings, the courtyard has a glass roof which lets light, wind and rain through, creating an ever-changing environmental reservoir with beneficial effects on the rooms inside. 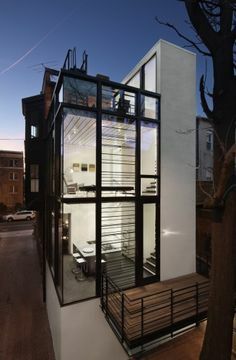 The floor plan of the three levels reveals a noticeable absence of passageways, as direct communication between different rooms is preferred, without any clear divisions between the spaces but with folding doors and windows to permit flexible management of the space as a whole. 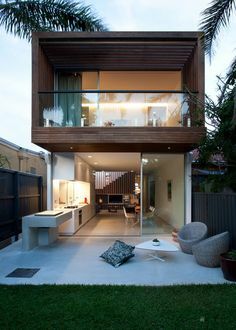 This is clearly an introspective building, in which every view and every glimpse of one room from another is designed to encourage observation of space and contemplation of the natural element present in the patio-garden on each level. The home’s oriental character comes closer to our own experience when the project opens large circular holes in the cement slabs: on the roof, to create the “rain room”, a space designed specifically to permit contemplation of the water, and in the courtyard, where a climbing plant seems to want to cast itself out of the opening in search of moisture. 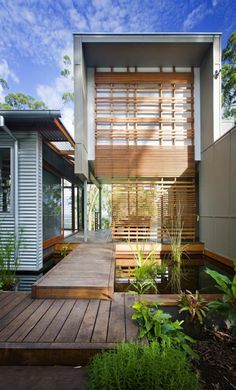 The dark wood frames and the natural green contrast with the neutral cement surfaces designed to be contaminated and “interpreted” over time by the growing vegetation. These waterways reveal their full power during the monsoons, when they flood three quarters of the country’s land, leaving behind a thin layer of fertile soil which has always been an important resource for the country’s economy, still prevalently based on agriculture.